KIEV, Ukraine -- A cease-fire between Ukrainian government forces and pro-Russian separatists appeared to be in danger Tuesday as President Petro Poroshenko said he may end the weeklong agreement early. 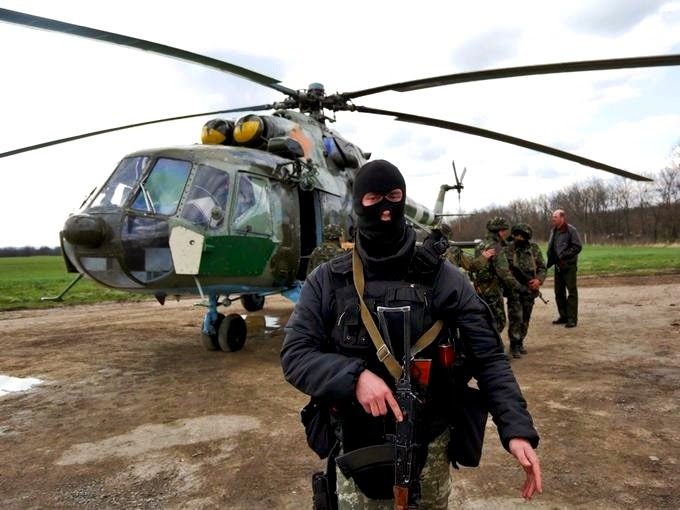 Ukrainian soldiers stand guard near a military helicopter near Izyum, Ukraine. The announcement came after rebels shot down a Ukrainian military helicopter Tuesday near the city of Slavyansk, leaving nine people on board dead, according to the Ukrainian government. "The president doesn't exclude that the cease-fire could be lifted ahead of time, taking into account its constant violation by the rebels controlled from abroad," Poroshenko's office said. Pro-Russian insurgents in eastern Ukraine had promised Monday to abide by the temporary cease-fire that was declared Friday. The uptick in violence comes as Russian President Vladimir Putin urged Ukraine's government to extend the cease-fire and launch talks with rebels with the goal of giving residents in the mostly Russian-speaking east a sense of security and protection of their rights. "We hope that the cease-fire will be extended and it will be used for substantive talks," Putin said on a trip Tuesday to Vienna. However, Putin reserved the right to come to the aid of ethnic Russians in Ukraine. "We will always protect ethnic Russians in Ukraine, as well as the part of Ukrainian people who ... feel part of the wider Russian world, and we will not only monitor this but also react," Putin said. "I hope that armed forces will not be necessary for this." Andrew Weiss, a Russia and Ukraine expert in the administrations of former presidents Bill Clinton and George H.W. Bush, said Tuesday's developments show Russia has more control in the political role of separatists, but authority over fighters remains weak. While some talks were jump-started by the cease-fire and there's been a change in the separatists' leadership, too many weapons remain spread across the east, he said. "Any peace process that doesn't include disarmament will be shaky and hard to verify," Weiss said. Earlier Tuesday, Putin asked lawmakers to cancel an authorization for the use of Russian armed forces in Ukraine in advance of a European Union summit Friday, where members said they would consider toughening sanctions on Russia for its role in the Ukrainian unrest. Poroshenko hailed the proposal as a "first practical step towards settlement of the situation in eastern Ukraine," according to a statement from the Ukrainian leader's press office. Several European foreign ministers have threatened additional sanctions if Russia does not cooperate with Poroshenko's plan — which offers amnesty and safe passage for separatists who have not committed "grave crimes" and promises "steps for decentralization of power" in the region — and continues to allow arms and militants to cross its border into eastern Ukraine. Thus far, the EU has ordered visa bans and asset freezes for a list of officials but has refrained from imposing broader economic sanctions. European leaders are unlikely to be naive about Putin's "rhetorical commitment" to de-escalate the crisis when they review the situation Friday, but his declarations may prompt fewer sanctions for Russia, said Ian Brzezinski, deputy assistant secretary of defense for Europe and NATO policy under former president George W. Bush. "He's doing things that are easy to give hope in Europe and the West that he's backing off," Brzezinski said. "That makes it more difficult for them to clamp down with more severe sanctions."